Proof positive that our BHS Team have been out in our community of late! 1. Book Fair on November 28th at Milton- ‘manning’ our BHS table are Joan Downey and Patricia Taylor. They were located in the Waldie Blacksmith Shop – note background. Our very own Joan Downey is the BHS rep on this committee and she is holding the sign “Votes for Women”. 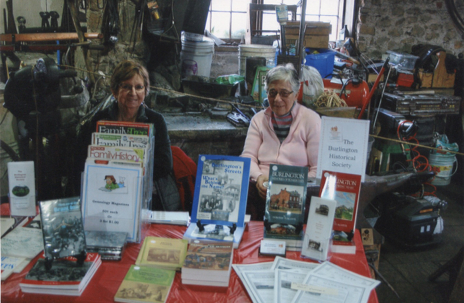 BHS was one of the twenty organizations represented at the Heritage Fair along with other heritage partners such as Heritage Burlington, Museums of Burlington, Burlington Public Library and Doors Open Burlington to name a few. 3. Visit our BHS Table display in the Central Library from February 19-25th. 4. Many hands make lighter the work! Are YOU interested in volunteering for BHS? If so, we would be very pleased to have you. To volunteer, please email info@burlingtonhistorical.ca.